Barmouth or Abermaw in Welsh is one of the most picturesque resorts on the Welsh coast with the hills as back ground. The blue flag beach makes Barmouth a great place for holidays or just to visit for a day. There is lots to entertain you here from walking, cycling, lazing on the beach, catching crabs, visiting the Dragon Theatre and other attractions nearby, watching the steam locomotive go by or take a trip on the small pedestrian ferry which takes you across the estuary to Fairbourne where you can have a ride on the small steam trains. 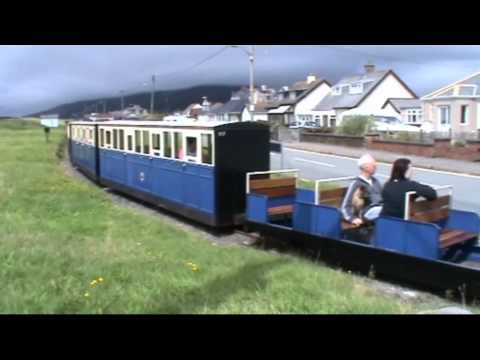 The Fairbourne Steam Railway is a narrow gauge line which runs for 1.5 miles between Fairbourne Station and Penrhyn Point on the Mawddach Estuary where you can connect with a pedestrian ferry to Barmouth. Return tickets are valid all day on the day of purchase and the Fairbourne Museum and Model Railway Exhibit at the station are free of charge. During the summer holidays the steam locomotive ‘The Cambrian’ crosses over the famous old wooden viaduct and footbridge, built in 1866 over the River Mawddach estuary in Barmouth. The Cambrian runs from Machynlleth to Portmadog or Pwllheli and provides excellent views of Cardigan Bay on one side and the mountains of Snowdonia on the other and along the way you will see many sights of historic towns, seaside resorts, beautiful castles, narrow gauge railways and many more delights. Barmouth is a great place for catching crabs all you have to do is go into one of the shops and buy a crab line for £2.00 and a small bucket for £1.50 and then go to the end of the pier and crush some muscles which you can find plenty around the pier and then put them into the bag, or you can use smoky bacon if you wish, and you will be amazed at how many crabs you can catch. 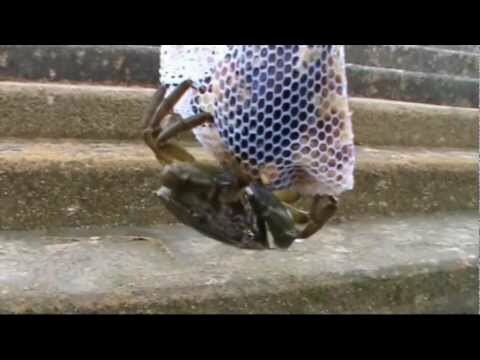 Catching crabs is great entertainment for kids, mums, dads, grandmas, and granddad’s this will be the best £2.00 or £3.50 you will ever spend. We park in the car park near the beach and after a walk round Barmouth we head towards the wooden railway and footbridge over the River Mawddach Estuary. This is a toll bridge and costs 70p return. After crossing the bridge we come to a Morfa Mawddach Station which is small station platform here we go straight ahead and follow the path to a ‘y’ junction near the car park. We take the right path and then follow the road *(please take care) then turning right and then right again, sign posted Fairbourne Station. We walk through Fairbourne over the railway line and past the railway station, where you can get a drink and a bite to eat, and follow the road which turns right along the beach. Immediately after the golf course we take the path, sign posted, on our right. We follow this path along an embankment until we come to some rocky mounds where we sit and wait for the steam locomotive to cross over the toll bridge we walked over at the beginning of our walk. The locomotive is an awesome sight and we watch until it goes out of sight. We then carry on forward until we arrive back at the Morfa Mawddach Station and then walk back over the bridge into Barmouth. We then go to the pier to spend some time catching crabs and then walk down the beach to see what we can find in other sea creatures. Great fun! How old are we certainly not 8 years of age. *To avoid the road at Morfa Mawddach Station you can go over the railway and walk through the gate turning right and then left and follow the footpath along the embankment to the beach. Here turn left for Fairbourne Station or right for the pedestrian ferry. This is a nice easy flat walk and is suitable for wheelchair users up to the car park just past the Morfa Mawddach Station over the toll bridge. The full walk going by the road is approx 6.75 miles. The walk across the open land to Fairbourne Station only is approx 3.75 and to the ferry only is approx 3.75 miles using OS map OL23. Barmouth, Gwynedd in North Wales. Barmouth is situated on the A496 towards the Welsh coast. There are two public toilet blocks in the centre of Barmouth and also some next to the beach going northwards. There are also public toilets at Fairbourne Station. For refreshments in Barmouth there are plenty of pubs, cafes, restaurants, fish and chip shops, Chinese and Indian take-aways and many shops and supermarkets. In Fairbourne there is the Fairbourne Hotel and a cafe and shop at the station.